The KVB - Only Now Forever. Vinyl LP, CD. Bleep. 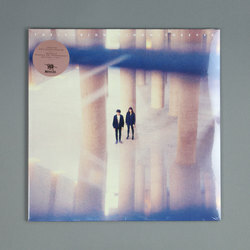 Nicholas Wood and Kat Day of Berlin-based shoegaze duo The KVB release ‘Only Now Forever’, their sixth album out on Invada. In comparison to KVB’s earlier releases, ‘Only Now Forever’ possesses a poppier approach to sound, abandoning the duo’s former minimalism in favour of a fuller and more choreographed approach. This technique serves them well, as they manage to retain all the poignancy of their previous sonic experiments. Recorded in their Berlin apartment during 2017, the LP is an exciting development for the duo, with highlights including Wood’s vocals on ‘On My Skin’.